Looking for ideas to make your Christmas menu extra special? Crepes are the perfect food to complement your family’s Christmas meal this year. Whether they are already a part of your tradition or you are looking for a great way to add to your meal selection, crepes make a great addition to any spread. There are tons of sweet crepes to choose from for your dessert table, and plenty of savoury options for your dinner menu as well. Prepare your own with the Crepe Delicious machine, on sale in December for just $175 compared to its regular price of $249! Our Tibos machine is perfect for home use and makes a fantastic addition to any kitchen. It is also a unique gift for your loved one this holiday season. Make perfect crepes easily all year long, and give a gift that keeps on giving. Sweet and savoury options mean the only limit is your imagination. Prepare delicious crepes for Christmas morning and Christmas dinner. You can make and stuff them ahead of time, or prepare them fresh. Either way is sure to impress your guests. For Christmas Morning: Why not try a coffee mascarpone cream for a tasty start to the celebrations? If you want a savoury breakfast instead, how about spinach bacon crepes with hollandaise sauce? For a Healthy Side: Looking for something light alongside your plate? Whole wheat crepes are versatile and tasty. Prepare them ahead of time and serve them with gravy for dinner or with fresh fruit for a light dessert. For Christmas Dinner: Steak, spinach and mushroom crepes with balsamic glaze provides a delicious option for the main course. For Feeling Festive: Eggnog crepes are the perfect Christmas crepes, providing a unique twist on a classic that will get everyone in the holiday spirits. Add diced ham and cheese, orange liqueur or simply sprinkle with icing sugar to take them from the main course right through to dessert. For Holiday Desserts: Apple cinnamon crepes are a classic option that is sure to please all ages. If you prefer something sweeter, try chocolatey peanut butter crepes with spreads and crumbled Reese’s cups for a delicious and indulgent dessert. Running out of last minute food ideas? Entertaining guests is stressful enough. 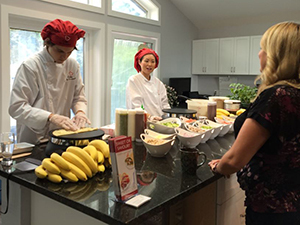 Eliminate the stress of preparing holiday meals and book our friendly and experienced Crepe Chefs. Enjoy time with your company and surprise guests with sweet and savoury crepes made-to-order. Crepe Delicious offers Home and Office Catering services. Book our Crepe Delicious experts to come to your home or office and prepare fresh crepes for your entire gathering. Nothing tastes better than fresh crepes with a tailored selection of toppings or ingredients. Our crepe station fits perfectly in any indoor or outdoor location, and is suitable for events that are formal or casual. Why not give the “gift of yum” this year? 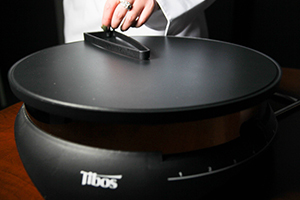 Crepe Delicious will have the Tibos crepe machine on sale for $175 only in the month of December (Regular $249)! Catering is also available. Have our Crepe Delicious experts cater your Christmas dinner this year.